#1) My grout joints are too big and there are too many of them. Cleaning is a constant battle. I use chemical warfare (toxic cleaners) to ‘try’ to win the losing battle vs. the joint. #2) My shower pan isn’t sloped right. I have puddles of standing water after every shower. #3) Stepping over our shower curb is dangerous. It’s an accident waiting to happen. What if you could blow up all 3 of these problems in one swoop? Well – you can. Here’s how. 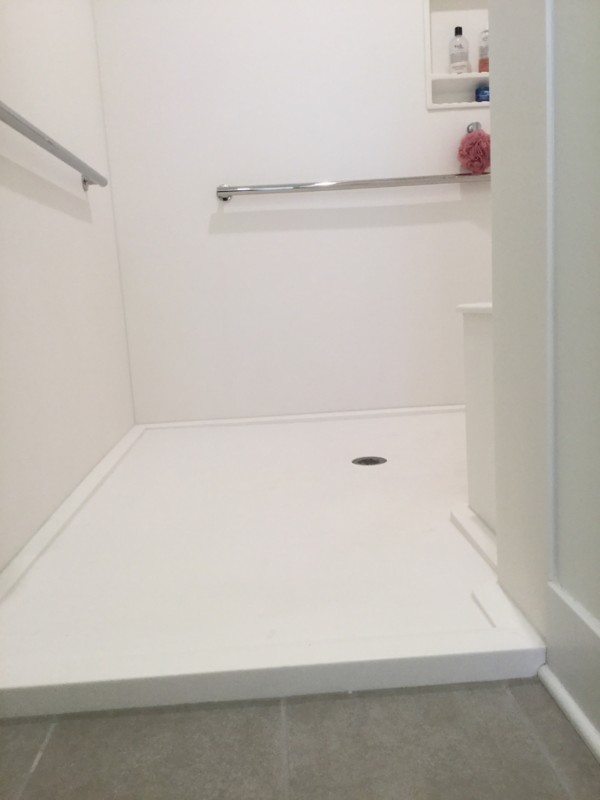 Create a ‘boundaryless’ one level wet room with a linear drain. This system uses a glass reinforced plastic (the same material used in aircrafts) shower base former which creates the slope of the pan. Then cement board (or other tile underlayment materials) are brought up the base former. 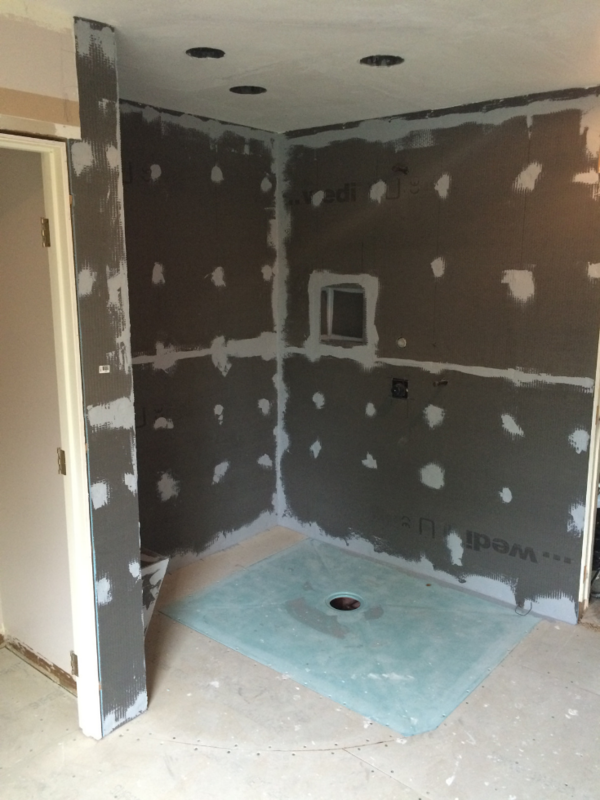 The entire bathroom (not just the shower) is then waterproofed. Finally, a latex modified thin-set is put down and tile laid on the surface. 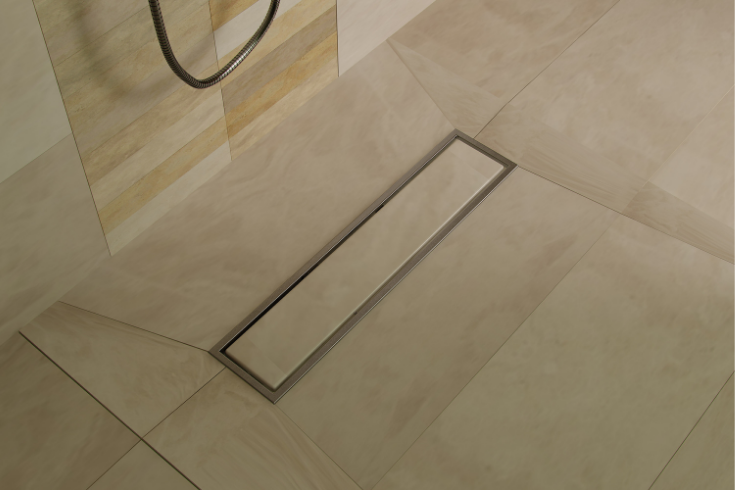 With the linear drain you can use large-format tiles to reduce the size and number of grout joints. When you’re done you’ve got a one level waterproof bathroom. It doesn’t matter if the water comes out of the shower. The bathroom and shower floors are waterproofed. It’s a boundaryless shower. This system is perfect for small bathrooms. 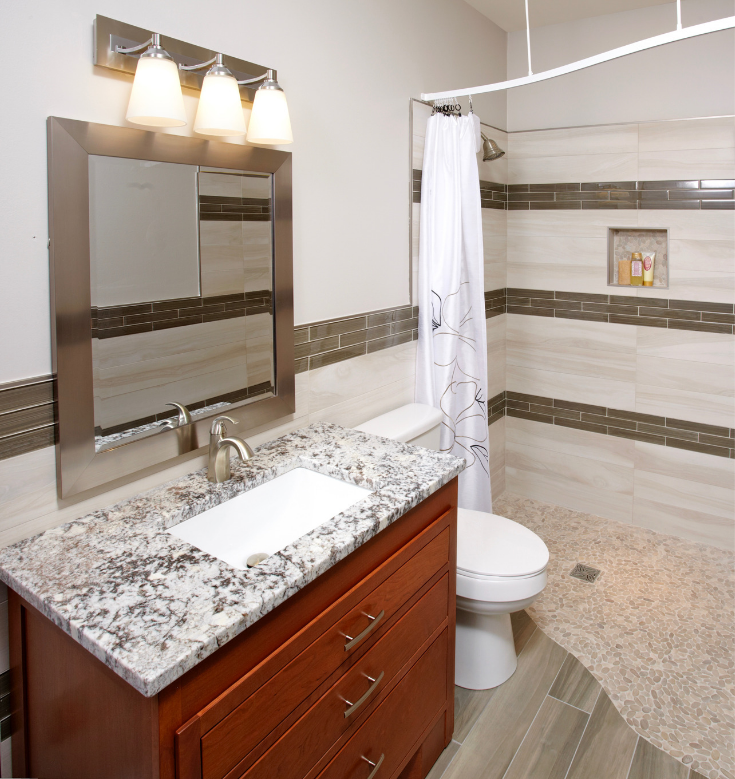 You’re creating one continuous space which is more efficient than compartmentalizing the shower from the bathroom. The system is idea for a family member who needs the assistance of a walker or wheelchair and requires a roll in shower. Does alternative 1 look good to you – or is this open concept too ‘open’ for you? Standard sized shower pans may ‘do the job.’ However, they aren’t exciting. Here’s an idea to make your shower roomier and more interesting. It’s to use a curved shower pan and glass enclosure system. For example, let’s say you’ve got a 30” deep tub alcove space (i.e. the walls on the left and right of the tub are 30” wide). You’re planning to convert your tub into a shower. However, you’re concerned because you’ve got some ‘big-boys’ in your family (OK – if we’re being real, they weigh too much). You know the 30” depth with feel too tight for them unless they can be hypnotized into the Jenny Craig crash weight-loss program (not likely). There is a way to ‘trick this space out’ and make it bigger. No, it’s not a crazy David-Copperfield inspired feat of magic. It’s to use a curved shower pan with a pre-made curved glass enclosure. This shower pan is 30” on the left and right but bows (or curves) out to 36” in the middle. You’ll get the elbow (or gut) room for your ‘big-boys,’ and have a more stylish space. Sounds like a “BOGO” special deal to me. And since the curved pan and curved glass are manufactured in standard sizes, it won’t bust your budget. For some of you reading this buying a shower pan is not about making a fashion statement. You want function. You want durability. You want a pan which eliminates maintenance. You want a safe pan. You want no fuss, no muss. You want the design to be built with the K.I.S.S principle (Keep It Simple, Stupid). Reason 1) It’s built from a cultured man-made stone which doesn’t absorb moisture. Reason 2) It’s textured matte finish texture won’t show water spots. Your OCD spouses’ need to clean won’t kick in, unlike with an easy-to-see-the-spots glossy shower base. Reason 3) It comes in standard and custom sizes. Reason 4) It’s doesn’t have to be boring. It comes in 30 colors of cultured granite, marble and quartz (although it can be white or bone-colored to blend in, if you’d like). Besides ugly, moldy grout joints in tile showers or dirty yellowed fiberglass pans, what’s the next most ugly element living in every shower pan? If you guessed the pitted, round, hair-filled drain strainer cover, you’re the grand prize winner. Sorry – I’m not sure what you’re the grand prize winner of yet. However, when I come up with the prize it will be BIG. Round drain covers are Ugly (with a capital U). What if you could blow up the drain cover and still have a place for water to drain? Well, you can. Here’s how. Use a base with this concealed ‘weapon.’ It’s the hidden drain cover. The pan shown below is a cost-effective acrylic base where the cover hides the drain. This ‘leave-the-drain-cover’ system also exists for tile ready bases. Would you like to blow up your drain cover? What are you waiting for? The ugliest thing to many people about buying a new shower pan may not be it’s features and benefits. It’s the jaw-dropping price once you figure out what you need. He drives 45 minutes to the store on his one day off. Traffic is insane on Saturday. He searches everywhere in the store for the clerk he talked to on the phone and finally tracks him down. The dude shows him the base. Tom sees it and is bummed. The dude asks why. He says, I need the curb on the 36” side, not on the 48” side. Do you have any of those in stock? The dude laughs. No way, he says with a surfer-guy twang. You’ll need a special-order stone shower pan to make that happen. Tom asks the price. The dude says $975. Tom thinks, “I’m S.O.L.” Now what? In all seriousness, there is a ‘FlexPan’ acrylic shower base system which has an ‘add-on’ tiling flange. It gives you the flexibility to use the same 48” x 36” base (or other sizes in this line) in 5 different layouts. You’ll be able to use a standard shower pan (i.e. lower cost) where usually you’re sucked into buying a custom base. This FlexPan saves time, money and aggravation when your glass or curb design doesn’t fall into the ‘most popular’ category. Would you like a rustic, Zen-inspired or Bohemian style bathroom? 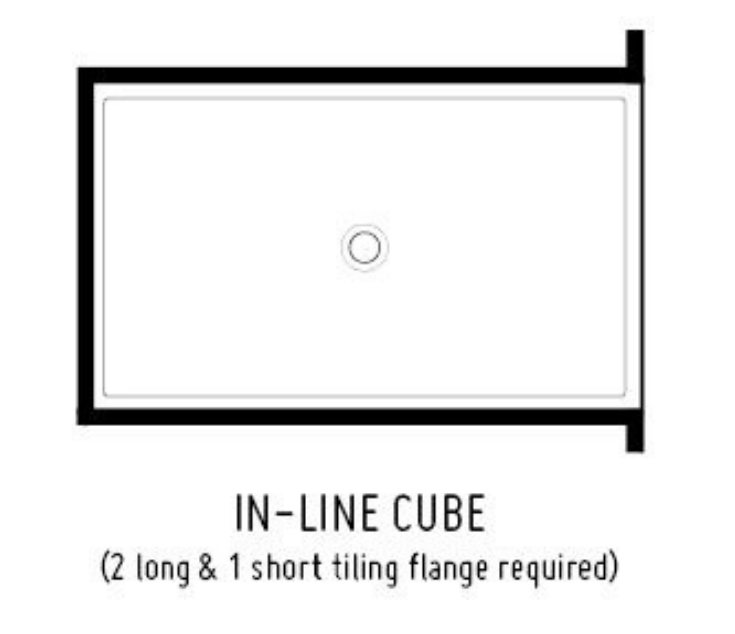 Does the rectangular shape of ‘standard’ shower pans say B-O-R-I-N-G to you? Perhaps you want spaces which visually flow into another. You know there’s no way to make this happen with the cheap-box-store base your contractor just hauled in. What can you do? 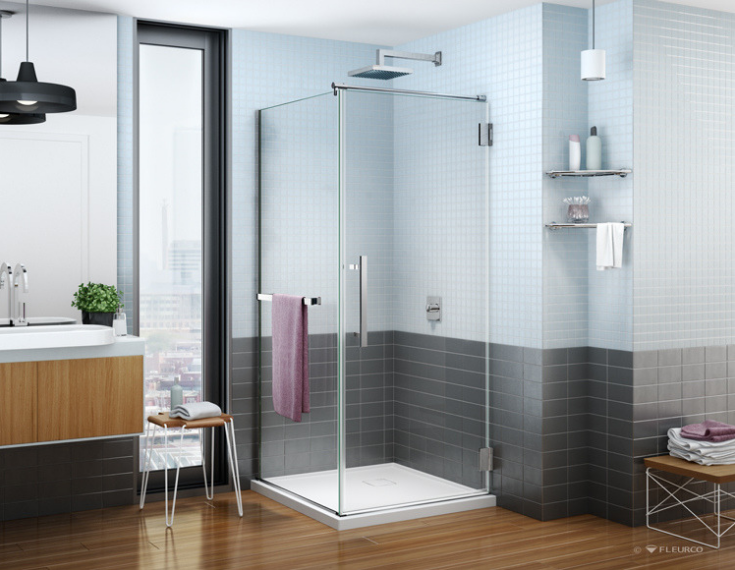 One stylish option is using the ‘boundaryless’ shower system discussed in alternative #1… with a twist. This twist will be the creative artistry of your tile setter. Since the waterproofing of a wet room extends beyond the shower, you can lay your tile or pebble floor pattern beyond the traditional shower space. Imaginative tile designs are free to live anywhere on your bathroom or shower floor in any continuous pattern you like. You want your shower and bathroom to feel like a spa, even while you’re rushing around 5 days a week getting ready for work. You’ve chosen low-maintenance, high style matte black finishes for your fixtures. You’re adding a rain-head for the relaxed shower you’ve dreamed about. You’re installing in-floor heating. This spa bathroom is going to be fabulous. One problem. What shower pan will compliment your relaxed, organic, spa-inspired look without bringing you to your knees cleaning it? After who really wants to be a slave to the common tile shower floor used in 99% of the spa bathrooms? Here’s the perfect alternative. It’s a textured stone shower pan. It’s available in matte black or matte white finishes in 3 fun textures (wood, stone and slate). Boring it’s not. Easy to maintain it is. I hope you see your shower pan doesn’t have to be the Achilles heel of your bathroom design. 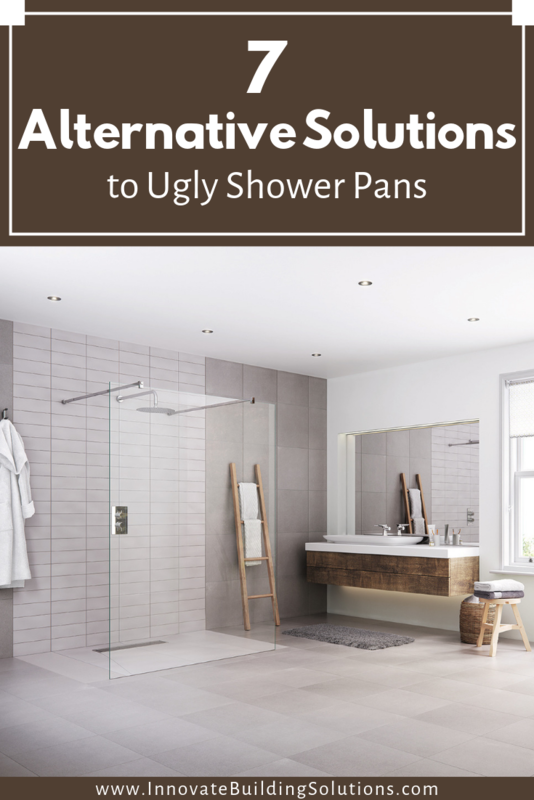 You have choices to move it beyond ‘ugly status.’ Elevate (OK – maybe not literally) your base with these 7 alternatives for stylish, safe, fun and functional shower. Can I, or a member of my team, help you? 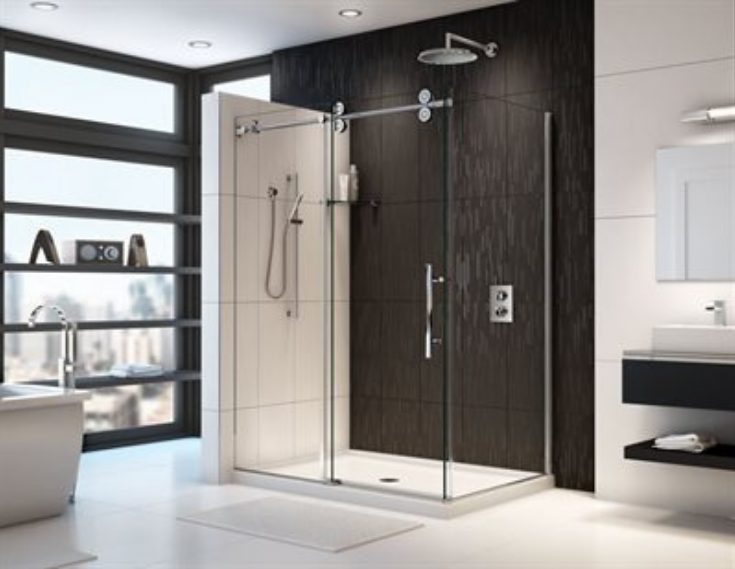 For Nationwide supply of tub and shower wall panels, shower enclosures and shower bases call Innovate Building Solutions at 877-668-5888. For a remodeling project in Cleveland contact Cleveland Design and Remodeling at 216-658-1270 or The Bath Doctor at 614-252-7294 in Columbus Ohio. If you want more advice (or like wacky humor) follow me on Twitter @Mike_Foti or my companies @InnovateBuild or @InnovateHomeOrg.